Senior forward Jack Ceglarski fights against SUNY Oneonta defensemen for possession of the puck during the Knights home game on Saturday Jan. 21. The Knights tied the SUNYAC No. 1 seed with a final score of 5-5. The second half of the 2016-17 hockey season continues to yield success for the Ice Knights. After a long winter break, the Knights have risen to No. 4 nationally for the second time this season. Since the start of the second half, the Ice Knights have posted an impressive 3-1-2 drive, scoring 29 goals over six games and allowing 18. The Ice Knights currently hold 2nd place in the SUNYAC conference and hold the nation’s No. 1 offense at 5.12 goals per game. Two large factors are responsible for the Ice Knight’s resurgent success: a schedule packed with home games and a change in the offensive lines. For the first half of the season, the Ice Knights saw the ice of the Ira S. Wilson arena only three times against opponents. This second half promises more exposure to the atmosphere of the Ira for the Knights, however, with nine home games to be exact. Line changes on the front end also had large implications for the Ice Knights’ success. One of the strongest performances has come from the new second line of first-year forwards Conlan Keenen, David Szmyd and Andrew Romano. “I think our freshman line was outstanding; they were dynamic and fun to watch,” Schultz said. The three first-years currently hold the 2nd, 3rd and 4th highest amount of points on the team, with Keenan leading in overall goals scored at 15. A new addition to the Ice Knights this semester is junior defenseman Mitch Ferguson. 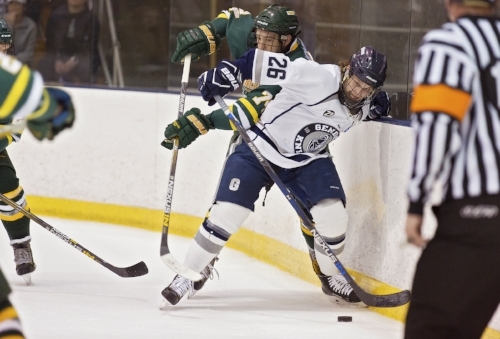 The Calgary, Canada native transferred from the University of Vermont during the off-season and has tallied two assists in five games. With a 7-4 win over SUNY Cortland on Friday Jan. 20 and a 5-5 tie against conference rival nationally ranked as No. 3 SUNY Oswego on Saturday Jan. 21, the Ice Knights find themselves 2nd in the SUNYAC conference, with the Buffalo State Bengals right on their heels with an extra game to play. With Geneseo’s No. 1 offense and Buffalo’s No. 3 defense in the nation, expect another exciting match between the two at the Ira on Feb. 11. In the meantime, Geneseo strives to continue their success in conference with a pair of games against the SUNY Morrisville Mustangs. The Mustangs currently sit near the bottom of the SUNYAC conference with an overall record of 2-14-3. They will host the Ice Knights on Friday Jan. 27 with play returning to the Ira the next night on the 29th, the puck dropping at 7 p.m. for both contests.